It all started with a missing cat. Wait, scratch that, it actually started long before humanity came into existence. But Dirk Gently’s case was to find a missing cat. Given his assertion of the interconnectedness of all things, he’s definitely the best man to see how a ghost, aliens, time travel and Samuel Taylor Coleridge (among other things) tie into the odd behavior of a college buddy of his. But he’d better hurry, because failing to solve the case will result in the destruction of humanity! 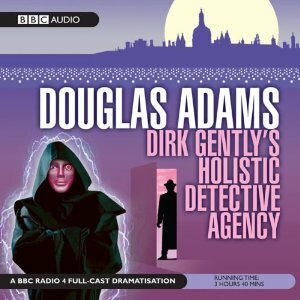 Despite being a Douglas Adams fan, I’ve never actually read any of the Dirk Gently books. I first became aware of his work after seeing copies of The Hitchhiker’s Guide to the Galaxy at practically every book store I visited as a child. I think it was the eyeless green thing sticking out its tongue on the cover that initially drew me to it. Eventually I wound up reading the entire series and just as I was preparing to get into the Dirk Gently books, my school workload increased to the point where I just didn’t have the time. And wouldn’t you know it, I completely forgot about the books when I finally had enough time to do so! Judging from what I’ve read online, there were definitely some alterations made in the transition from the printed page to the radio. I can’t say what exactly was changed, but I can say the acting is all top-notch and I thought it was a fun ride. That said, it was more restrained than Douglas’ work in the The Hitchhiker’s Guide to the Galaxy series. It’ll definitely tide me over until I can get my hands on the original novel. Sci-fi fans should be especially interested in how this story combines elements of two scripts he worked on for Doctor Who.